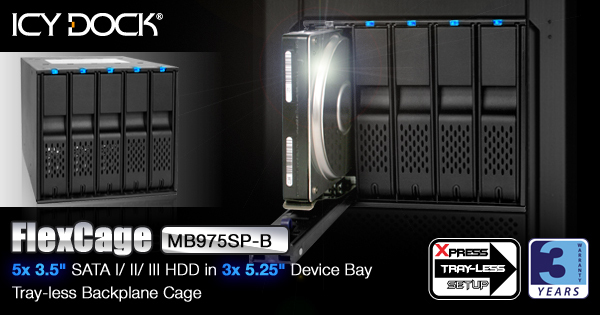 Introducing the FlexCage MB975SP-B, a 5-in-3 Tray-less SATA 6Gbps HDD Cage for 3.5" SATA hard drives. The FlexCage focuses on maximizing storage density, while using the least amount of 5.25" device bays possible. To complement the device, the FlexCage uses features such as: Elegant plug & play Tray-less design, replaceable 80mm cooling fan, 3 speed fan control with Smart Cooling Technology, and full control of your drive with individual power buttons. With a large density of drive storage, it can be used in consumer, enthusiast, and system integrator systems that hot swap drives frequently. The FlexCage is compatible with most gaming / media / server computer cases, and it is perfect for file server application such as unRAID, Windows home server and others. The MB975SP-B is designed to maximize space use by allowing up to 5 x 3.5" SATA III hard drives, while only consuming 3 x 5.25" device bays. 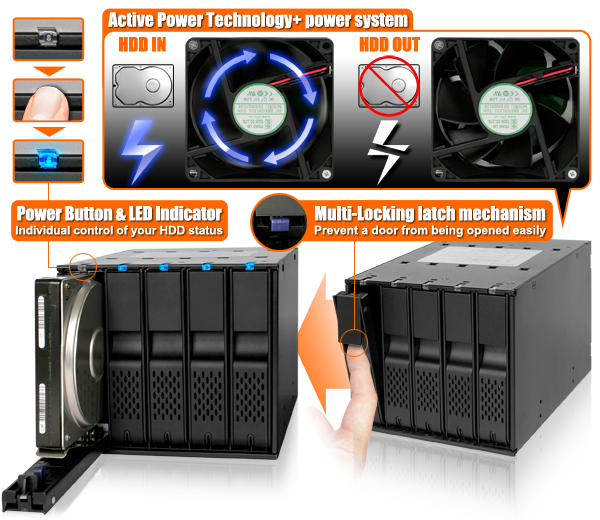 The FlexCage also only requires three 15-pin power ports to power up to five 3.5" hard drives. Last but not least, the FlexCage is equipped with our proven tray-less technology - no screws or tools are necessary to insert or eject the drives, making hot swapping a completely hassle free experience. The FlexCage MB975SP-B uses a large 80mm rear cooling fan to pull cool air from the front ventilation slots, over the drives, and exhaust the warm air out through the rear ventilation slots. The MB975SP-B gives the user freedom to choose the speed of the fan, or to select "auto" so that the fan adjusts its speed using our Smart Cooling Technology. The auto function determines the temperature of your drives, and changes its RPM accordingly. This results in decreased power consumption, an increased lifespan for your fan, and unnecessary excess noise. Along with the auto function, the user can also choose a high setting, best used for intense applications such as home server use, or a low setting, best used with lighter work loads or silent operation, such as hourly back ups or audio recording / editing. The FlexCage MB975SP-B features full aluminum housing and an all matte black exterior finish. With its minimally intrusive front design the FlexCage fits in seamlessly with premium enthusiast PC cases. The MB975SP-B uses the popular Active Power Technology+ power system, giving you full control of your hard drive environment. To power up your hard drive, the front of the device includes individual power button for each drive and double as an LED indicator showing drive power and activity status. 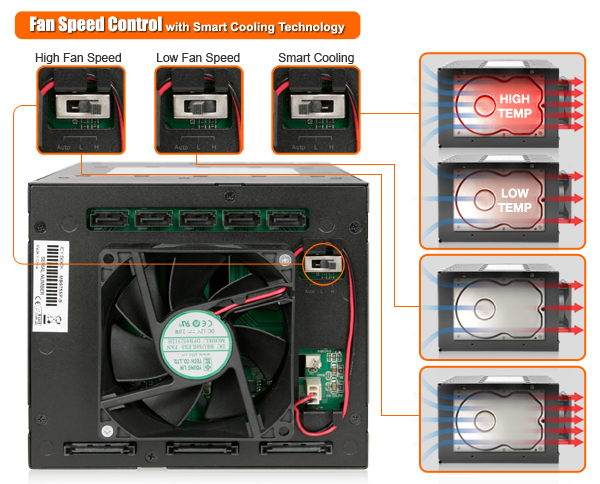 When one drive is turned on, the 80mm cooling fan will also turn on to start cooling your hard drive. Similarly, each drive door has a multi-locking latch mechanism in order to prevent a door from being opened easily. Each door uses a metal latch assembly and strike plate in order to keep your drive secured and reliable while in operation. Anti-vibration technology is included on each of the doors and internally to help prevent reduction in drive performance. Lastly, to ensure a peace of mind, the FlexCage is backed with our 3 year warranty, equivalent to a hard drive's warranty. 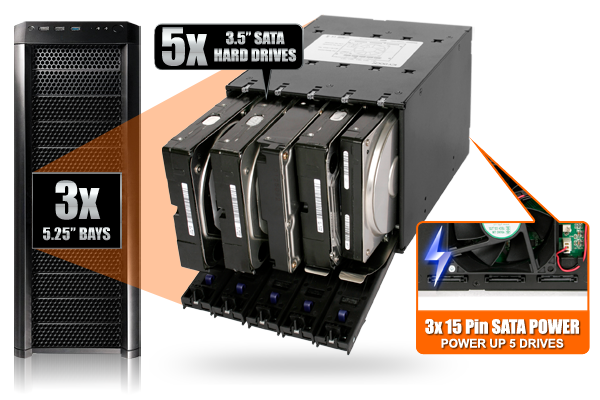 * Fits 5 x 3.5" SATA III HDD into 3 x 5.25" Device Bays. * Compact and space saving design to fit multiple drives. * Designed for consumers & enthusiasts gaming / media / server computer cases and servers. * Tray-less design for genuine plug & play and hot swap use. * Front and rear ventilation slots. * 80mm cooling fan for maximum air flow. * 3 speed fan control, including auto setting featuring Smart Cooling Technology. * Elegant full aluminum housing for durability and heat dissipation. * Fan is replaceable with aftermarket fans that use standard 2-pin or 3-pin connectors. * Active Power Technology+ - cooling fan and drive only powers up when the power buttons are pressed. * Multi-locking aluminum door latches to prevent accidental drive ejection. * ICY DOCK 3 year warranty equivalent to hard drive manufacturer warranty to ensure maximum reliability and long life.